Take a moment to picture the elusive workplace of the future – which, by the way, is now only a handful of years away. Millennials will represent 75% of the global workforce by 2025 – right now, at GetSmarter, millennials make up 90% of a 330-strong team – and within the next 3 years it’s expected Baby Boomers will leave 31 million job positions open as they head into retirement. On top of that, the rapid and disruptive evolution in digital technology you’re currently experiencing won’t be slowing down anytime soon; you’ll be expected to join progressive and diverse companies that are multigenerational, multicultural, multinational and gender-balanced; increasingly employers will put more trust in you – allowing you to work remotely and giving you flexible holiday benefits; and you’ll be given more autonomy over your professional development and career growth. Amidst all of this disruption, an evolved working professional will have to emerge – a digital native driven by change not by generational identity, with a demonstrated propensity for and ability to embrace education and learn new skills in a globally distributed, highly collaborative and always on-the-go workforce. But most importantly: they are lifelong learners. As a New Professional, you’ll be able to keep up with the pace of the career landscape by identifying and creating your own opportunities for skills development through a focus on continued education. Kentse Seleke, a past student on the UCT Business Systems Analysis online short course, identified an opportunity to expand her skill set within the IT field, thereby empowering herself to manage new work systems as well as improve her chances of getting a promotion. Investing her time into professional development through continued education paid off. She was promoted from Systems And Data Management Administrator to the sought-after position of Business Systems Analyst, and attributes the online course as being the “main reason” she was considered for the promotion. Her next plan of action is to complete the UCT Data Analysis online short course to ensure she is well-equipped for her new role. Kentse is a great example of a New Professional – hungry to continuously learn, eager to evolve in her job, and willing to work hard to make it happen. Prepare yourself for the workplace of the future by investing in new skills today. 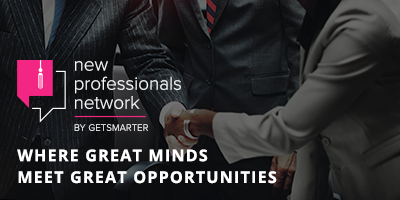 Study an online short course and be recognised as a member of the New Professional Network.